We sat at the far end of the bar for a bite to eat and I observed the people at the bar, who all seemed like a regulars, carefully. This seemed odd to me. The bartenders were conversing with everyone at the bar like they had been there many, many times. I wondered what the likelihood was that all 12 or so people sitting at the bar were regulars. It's probably not too significant, but it made an impression when one of the bartenders (her name was Tammy) came over to greet us, we didn't get the standard, "What can I get you? ", but were greeted with "How's your evening going so far?" The bartenders even treated the insufferable woman sitting next to us with a level of patience that I've only seen once before at a restaurant. I won't go into too much detail about this person except to say that when you're sitting at a bar, and you talk to someone sitting next to you, please take a hint when they don't reply to you with anything other than, "Thanks, that's nice." Also, if you feel that it's your purpose in life to tell those sitting next to you what wine to order, and when they decide NOT to listen to you, please don't get all pissy and laugh under your breath about what they actually did order. Ok, so do you get the point? The bartenders are cool. As the first night progressed, we went through our usual exploratory dining, sampling different dishes from the menu, and taking the bartender's advice on what food to get. 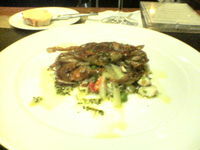 A succulent softshell crab appetizer deep-fried in a light tempura batter and roast duck breast, duck sausage and with duck foie gras and were the highlights from this evening. However, the beef short rib entree that I had was fatty and skimpy on the meat. This was despite the fact that my friend told me the night before to order the beef short ribs because they "were the best short ribs he'd ever eaten." Perhaps I got a bad batch. The other thing I remember vividly from that first night at the bar was that towards the end of our meal, Tammy (who by the second course managed to tell us where she lived, what her neighborhood was like and the name of her dog) was making secret trips back to the wine cellar to "find the good stuff." This made for an interesting night to say the least, and led to me having to spend another hour at the Starbucks sobering up before Amy or I could drive home. My second trip to the bar at Restaurant Eve was probably one of the most decadent meals I've ever eaten. More hyperbole: the night began with some of the best fried calamari I've ever eaten. 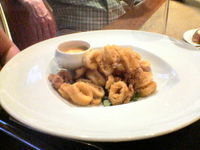 Rest assured, if you find something as common as fried calamari at Restaurant Eve, you'd better order it. I don't think I've ever tasted such tender squid. Ok, so fried calamari isn't so decadent. I'll continue. For entrees, we had pan-roasted veal sweetbreads and confit of braised house-cured pork belly. 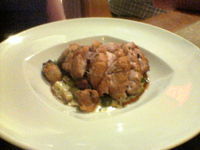 My portion of sweetbreads was gigantic --if your normal portion of sweetbreads was a 9oz. filet mignon, this would be a 28 oz. porterhouse. I appreciated the preparation of the sweetbreads, pan-roasted instead of fried, you could actually taste the flavor of the sweetbreads. The pork belly, which Tammy told us was a "chef's specialty", was a very unique dish. While I thought that our serving could have been more tender, the complex, smoky flavor of the pork with the cannelini beans more than made up for that. We returned a third time to Restaurant Eve, but I won't go into too much detail, except to say that you should definitely order the monkfish if it's on the menu.. I'd say that of all the entrees I ate there, this was my favorite. Perhaps it was the uncharacteristically tenderness of the monkfish, or the complexity that the spicy chorizo sausage added to the ragu it was served in. I'm not sure exactly, but it was well worth the $28.50 that it cost. Our desserts each evening were very good and changed every evening we were there, but my favorites were the chocolate mouse cake, which...ok, you just can't go wrong with a good rich chocolate mouse, and the strawberry panna cotta which had a very delicate flavor and pleasant texture. The cost of each of our meals at Restaurant Eve were pretty expensive -- ranging from $200 to $225 before gratuity. Keep in mind though, that each time we were there, we probably had at least three or four glasses of wine each, and with prices ranging from $8 to $15 or so per glass, this can have a serious impact for on your bill. Don't be a stupid lush like me. Ask the Sommelier to recommend a good bottle to go with your apps and entrees. So a normal person -- who only drinks a glass of wine with dinner -- will probably be able to keep the cost of the meal down a bit, especially considering that most entrees are below $30 and the appetizers are between $10 and $15. So I know that this is news to no one, but Restaurant Eve should be on everyones list of must-visit restaurants in this area. The food is original and unlike anything you'll get at other restaurants and you certainly won't be disappointed by your meals there. Parking: Street parking in Alexandria isn't too hard to come by, except on weekends. There are also parking lots all over the place. No valet. Closest Metro: King Street and it's a hike. Reservations: Taken in the Bistro and Tasting Room and are recommended. Amy's Bathroom rating: Very clean and well taken care of. Baby friendly rating: 1 diaper. Yeah, babies don't belong here during dinner. The only time I think it may be appropriate to bring a baby is during lunch in the lounge. The "automatic regular" feeling is how I felt when I was at Bombay Club last night. So refreshing. My DH and I have sworn to get back to that bar more often. We've been twice (and live in Alexandria so there's no excuse). Tammy took care of us both times. She's great for recommending food and wine. She paired a fabulous red wine with our cheese course, and I wish I could remember the name of it. It was slightly fruity, but just slightly, and ever so different than any wine I'd pair with cheese. A brilliant choice (sorry for the Eve-induced hyperbole here, but I can't control it and it ain't going away). 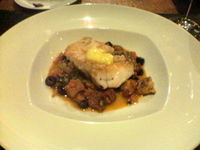 I also had the monkfish dish, however they were out so I got it with snapper. Still, very good stuff indeed. Shame, that after 3 RAMMY nominations, they were honored with zilch. That's some serious coin. We can afford to indulge in Eve only by means of the Lickity Split lunch, which is one of the most fantastic dining deals in the country, I'm sure. Order correctly -- a bacon, egg, and cheese salad and an Irish BLT, for instance -- and you will leave stuffed with unbelievably good food for under $20, all in. Not to be snarky, but I think you CAN go wrong with a "good, rich chocolate mouse." LOL. I can only add to all the good things being said about Restaurant Eve. The food is great, service no matter the Tasting Room (exceptional), the Bistro or the Bar is outstanding. Cathal and Michele are perfect hosts/chef/owners and the staff is always welcoming, helpful, and eager to take care of you. And, Todd, without whom Restaurant Eve just wouldn't be the same. In addition to Tammy, who we absolutely love, there is Ken, Jake, and Clinton. All make your visit to the bar whether to drink or to drink and eat a pleasure. Jake also can be found at the PX on Fridays as well as our good friend Dustin formerly at Eve now helping to run the show at Eammons and the PX. As for the strange lady at the bar, Ken and I have had the same experience, not once but twice. Both situations turned out fine, in one instant very well but it is discerning. People are sometimes different no matter where you are. The folks at Eve handle all situations well. Tammy is the best bartender in the world. Who is the new pastry chef at Restaurant Eve though? The food is consistent but the desserts seem to be hit or miss. 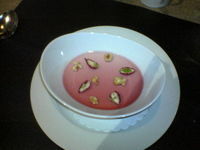 They are also disgustingly sweet!!! They are ALWAYS way too sweet, esp in the tasting room. I also had some goat cheese creme brulee that was soggy, rather than hard on the top. In terms of the food, its worth the price but if you are in the bistro, don't pay for dessert. There is always something "off" - or there are grossly sweet combos.. Did I say sweet? Go down the street to the ice cream shop after drink or have an after dinner drink!